In 2015 Apple grabbed a 94 percent share of the world's global smartphone profits, sold the only profitable tablets and smartwatch, increased its Mac unit sales,, launched a successful NFC payment platform, took a huge slice of the music streaming market and introduced a new platform for the living room. How can it possibly beat that performance in 2016? Yarow raised some scary sounding ideas about Apple before dashing them himself with facts, then started over with some less sensational, rather basic complaints about how he thinks Apple could be doing better in various ways, such as retroactively introducing products years before they were developed, or alternatively holding up the release of new products until there are no possible ways one could ask for improvement. While the article itself says nothing worthy of note, it's useful to consider the white space around it: the real facts that Yarow tiptoed around and apparently went out of his way to fail to acknowledge in order to generate some content to satisfy the Apple-centric SEO quotas at BI. It's a lengthy article that never once contemplates how the world is changing around Apple. The reality is that it will be much easier for Apple sell iPhones, iPads, Apple Watch and Macs in 2016 given that its competitors are now weaker than they were in 2015. If you've forgotten already, 2015 was the year that Apple's primary mobile device competitor imploded and the figurehead of a legacy software company dabbling in hardware rather arrogantly claimed that it was the most competent PC hardware maker left (which, astonishingly, was actually partially true). Virtually all of the established PC makers seemed to be evaluating how to get out of the business, even as Apple's premium-class Mac sales gained significant new ground. Including tablets with PCs, Apple now sells the most computers and the most expensive computers (and nearly all of the expensive computers), an apparent contradiction of the "common sense" understanding of price elasticity of demand and the premium-eroding nature of commodity products. Apple is essentially the Professor stranded on Gilligan's Island, except that rather than being the intelligent problem solver for a bunch of goofy half-wits stuck on an island, Apple is competing against them in the global market for electronics. The plight of Apple's competitors doesn't really come up much, but when grieved by concerns about Apple's precarious predicament on the biggest and fastest growing pile of cash in the industry, it should be considered whether Apple even really faces any effective competition. Real world competition, that is, not the representative products of "competitors" that make up a tiny irrelevant shred of the world's total market share, which really exist only to give enthusiast magazines something to compare against Apple. Take for example Google Nexus. While industry writers like to talk about how Google has "80 percent" share with Android, the actual units of Google-branded devices that compete with Apple are quite negligible (0.1 percent, according to IDC), despite the huge share of media attention provided to it. The number of people buying Nexus phones is less than even Windows Phone, and you'd be hard pressed to find any reasonable person who actually believes that Microsoft materially competes with Apple in the smartphone market. Remember in 2012 and 2013 when iPad was supposed to be under grave threat from Nexus 7 at its breakthrough price of $199? Everyone watched in anticipation to see how Apple would react to cheap 7 inch tablets. But in reality, it didn't even bother to respond. Apple continued selling its own tablet products at prices more than twice as high as Google's bargain tab. Despite that, iPads massively outsold Nexus 7, not to mention the rest of the entire production of Asus (the firm that was building Google's vanity tablet). It's clear Apple didn't consider Google's Nexus line to be a competitor that it needed to address in its own pricing. But the end result makes it pretty clear that Nexus never offered any real competition. In fact, Apple's peak iPad sales, when the company reached above 20 million iPads in holiday quarters, were sold at record profits directly in the face of Nexus 7, a product that barely shows up in global tablet sales. Two years later, Apple is selling fewer iPads, but it's not because of tablet competitors. Google isn't even trying to sell cheap tablets anymore, and its tablet sales have never reached up into commercial significance. Effective competition is not posed by a product that offers a dramatic price advantage yet fails to sell in relevant quantities. Last year, Apple's competition posed such little significance that the company dramatically expanded its sales even while raising the iPhone's Average Selling Price. Hardware prices in the tech industry are supposed to go down. They are for everyone else. Also down are margins and overall profits. 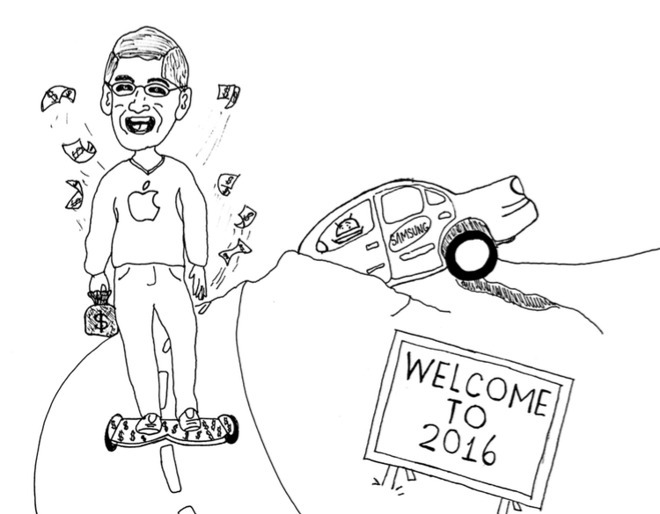 Apple's competitors are limping into 2016 even as Apple rolls into the new year on on a hoverboard made out of money. BI frets that Apple could possibly face flat growth in iPhone unit sales over the next year. That is, if you believe analysts who, based on December quarter supply chain channel checks, think they know how many phones Apple will sell three months from now, and who are currently contradicting Apple executives' own guidance pertaining to the quarter that just ended. As noted in a year-end report by Philip Elmer-DeWitt of Fortune, "even bullish sell-side Apple analysts" including Daniel Ives of FBR; Mark Moskowitz of Barclays; Katy Huberty of Morgan Stanley; Amit Daryanani of RBC; Aaron Rakers of Stifel and Timothy Arcuri of Cowen have been voicing Peak Apple concerns rooted in their sell-side equity research. Yarow states, "Publicly traded technology companies like Apple are measured by their ability to grow earnings and revenue," but then ignores both and begins talking about unit sales, even though none of the analysts worrying about flat unit sales are saying anything about Apple's earnings and revenue being at risk. Remember that many of these same analysts, including Morgan Stanley's Katy Huberty (who Yarow calls a "megabull on Apple"), were warning that Steve Jobs' Apple of 2008 faced a worrisome global macroeconomic climate that would kill sales of the premium products that the company was offering and drive impoverished recession victims into the arms of commodity product makers. Back then, analysts were indeed worrying about revenue and earnings, not just unit sales. That talk helped crash the demand for Apple's stock, slashing its going rate among investors in half by the end of that year. But it wasn't true. The analysts were wrong. Apple's stock price corrected itself by more than doubling in 2009, then nearly doubling again in 2010. In fact, Apple's stock has never ended a year with negative performance since 2008, except for this year, when analysts began saying the same kinds of things they were saying in 2008. Currently, Apple's stock has hit a new recent low, but it's about 780 percent higher than it was back in 2008, when analysts who didn't really grasp Apple's business were describing bleak troubles that seemed "common sense" plausible to many investors at the time. It's pretty clear those same analysts don't really understand today's Apple any better, in part because the Apple of today is much larger, has expanded into many new and differentiated regions and has a much more complex supply chain than it had in 2008, back when iPhones in the U.S.A. were only available via AT&T and the product wasn't even officially sold in China. This year, Apple is selling an enhanced "s" version of its iPhone 6, the duo of larger models that last year began as unproven new products in the market and appeared--according to clickbait content generators--to face significant competition from Samsung, by far the largest Android phone maker. Over the past year, iPhone 6 proved itself it be both very popular among early adopters and extremely satisfying to those who bought it, in stark contrast to Samsung, which witnessed a massive collapse in demand for its comparable, premium-range Galaxy S6 and Note 5 models. Samsung is facing not just flat growth for the coming year, but has already experienced an end to its smartphone growth last year! Not only is Samsung Apple's largest hardware competitor, but it's the only significant firm that offers any real competitive threat to iPhones at all. And it's collapsing. It's actively warning its employees (and again warned investors this week, just as it did last year) that things are not going well. Apple didn't warn analysts and investors that it was facing an end to iPhone growth. Tim Cook did the opposite during the September earnings call, explaining the credible reasons why the growth Apple was seeing with iPhone 6/6s would continue into the future. Cook is neither a member of the media nor an executive for Samsung, so under FTC regulations he can't materially lie about the financial situation of his company and expect to get away with it. At the same time, prior to its earnings call Apple is in a quiet period, so hedge fund managers know they can say pretty much anything. In early 2009, just after Apple's stock had last been ransacked by irresponsible financial reporting of CNBC, talk show personality Jon Stewart grilled Jim Cramer, the frantic host of its "Mad Money" entertainment show, for his act of being "doe-eyed innocent" while celebrating the admittedly illegal shenanigans of hedge fund managers, calling Cramer's act "disingenuous at best and criminal at worst." Rampantly false reporting is back with a vengeance. Prior to Apple's last earnings call, Cook earlier interrupted the non-stop speculation then swirling about Apple's supposed problems in China. Rather than appreciating the appearance of reliable information based on facts, the same people who had been spreading lies about Apple in China turned on Cook and suggested that it was improper for him to tell the truth during lie-season, as if stock manipulators should be able to deceive the market without being challenged. Last year, Samsung released twice as many flagships as it formerly has; it also unveils major new offerings at least twice as often as Apple's annual refreshes. 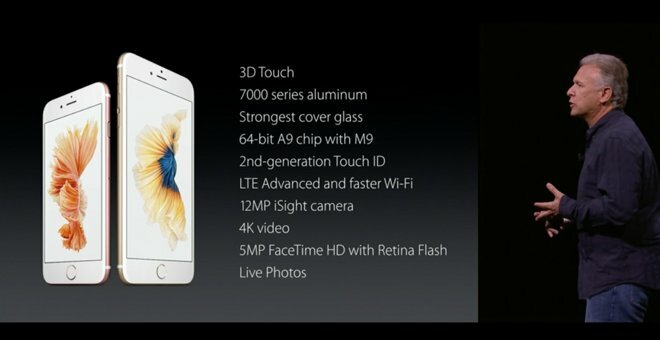 None of these really offered any resistance to iPhone 6. Over the previous three years, Samsung essentially paved the way for larger smartphones, but then flopped badly in response to Apple moving into the big-phone product category that Samsung could previously point to as a real and obvious differentiation. What's the next big thing? While Samsung already sells higher-resolution fablets than Apple's existing iPhones, those pixel counts are not an obvious differentiator in the market; based on what people were buying in 2015, iOS was considered more valuable than ultra high density screen resolutions. That wasn't as clear cut in 2014, when iOS was indeed losing some valuable sales on the high-end to Android phones with larger screens. That indicates that in 2016, pixel counts are not going to make a significant difference. Samsung also can't keep releasing larger and larger phones, because the value of a large display quickly starts to become a size, weight and clumsy interface liability after 5.5 inches. Samsung (and other iOS rivals) will have to invent something completely new to even have a chance of winning back losses to iOS on the valuable high end, but nobody in Android-land has proven to be very good at inventing compelling new differentiating premium features. Android's success has primarily come from how similar to iOS it can present itself as being, and Samsung's success has almost exclusively been based on closely replicating the appearance, behavior and features of iPhones as closely as it can. Unique inventions of Android and unique features conceived by Samsung have almost entirely been flops: LED trackballs, multiple hardware buttons, curved screens, 3D displays, hand waving gestures, eyeball tracking and facial recognition to name just a few. On the other hand, Android has historically introduced earlier support for emerging technologies such as LTE, NFC and 4K video before Apple. That's changing. Not only is Apple developing its own leading A-series chips, but it's also now in a position where it can simply watch struggling Android vendors try to innovate and harvest their best ideas. Now that the shoe is on the other foot, Apple has a series of clear advantages that Android makers can't afford to add to their downmarket portfolios, because Android hardware is increasingly differentiated only by price, and being cheap also means you don't have money to invest in new technology. Only a few Android flagships offer something like Touch ID, 64-bit SoCs, or support Google or Samsung's version of Apple Pay, and none yet have shipped a 3D Touch equivalent. Few have anything comparable to Apple's ecosystem features like Continuity, HomeKit, HealthKit and CarPlay. In fact, Google is so slow at releasing new Android updates that less than a third of its Google Play users can plug into the company's version of CarPlay. Apple is entering 2016 with an enhanced iPhone 6s lineup and a more affordable set of iPhone 6 models to offer, while Samsung has no success to build upon, and has instead clearly lost major market share and suffered a direct hit of its premium customer base. The Android licenses that have benefitted from Samsung's collapse are flooding the market with even cheaper models, making it even harder for Samsung to respond effectively to Apple's expansion on the high end. Apple of 2016 is not really competing against Apple 2015; it's competing against Samsung 2016, and that competitor is looking awfully weak. Nobody else in Android land is looking significantly better, while Blackberry and Windows phones have also started into a battle with relevance for another year, further stripped of their weapons and armor. Even their most strident fans are giving up. That's also the case on Android. Given that only 30 percent of the iPhone user base upgraded to iPhone 6 last year, the rave reviews of that product and new expanded features on the high end 6s--and price options on the lower end 6--should have no problem extending the 6/6s upgrade cycle throughout 2016. It may well be that Apple is seeing less demand for its latest iPhone 6s models, due to the fact that there is less to differentiate the 6 and 6s than there was between the 5s and the restyled 5c two years ago. However, this year Apple's "last year" model has a $100 premium Plus variant, and is offered in 16 or 64GB versions, making it more likely that even buyers who opt for a cheaper iPhone 6 will still maintain Apple's industry-leading Average Selling Prices. And while Samsung and other Android licensees have struggled to sell premium models of any kind, even Apple's thriftiest customers will be delivering an ASP far higher than the ASP seen among Android phones. However, the biggest smartphone issue in Apple's favor going into 2016 is the extended malaise hanging over Android, Windows, Tizen and Blackberry, all of which have languished while their users have observed Apple making substantial technical leaps and rapidly distributing free updates that keep iPhone users secure from mass exploits, protected from incessant adware tracking, refreshed with new technical capabilities and (for most users) enhanced as increasingly fast and power-efficient devices. While Apple is working on refinements and new features for iOS 10, Google is busy working to remove copyright infringing code from the next Android N, busywork that does nothing for Android users but delay other planned new features and fixes, with the potential side effect of introducing new bugs. Between iOS upgraders and switchers from other platforms, Apple currently has no visible end to its smartphone expansion. 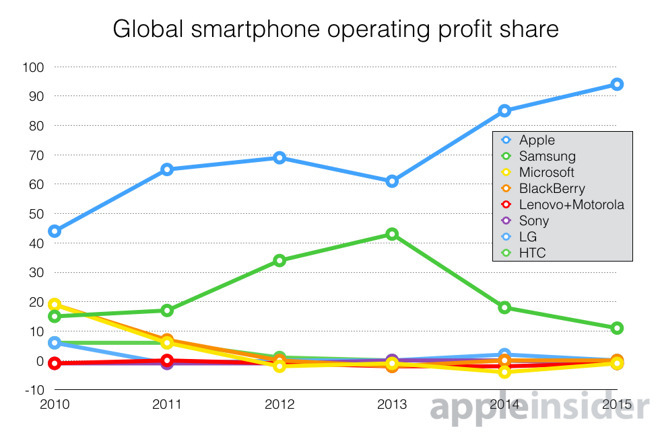 Android is indeed a massively large platform on a global scale. But that's also opportunity for Apple. One only needs to look at the last several years of increasing Mac sales, fed largely from Windows defectors in an era of flat Windows growth. Android is currently a larger pool to draw from than Windows was, and while much of that pool is shallow in terms of premium phone opportunity, it also represents a massive number of basic users who will eventually switch to a premium phone, the same way that basic "feature phone" users upgraded to smartphones over the last eight years. Five years ago, Microsoft incorrectly bet that a partnership and then acquisition of Nokia could parlay that firm's still significant basic phone market share into a demand for Windows phones. That didn't happen. Apple didn't have to spend billions of dollars to develop training wheels that taught basic phone users how much better smartphones were. Google did all the work and got its licensees to pay billions every year to advertise this. The beneficiary has clearly been the company that now earns 94 percent of the industry's profits. Until Apple actually begins to see flat growth in iPhones, let's instead look at its competitors, all of which are performing so extremely poorly that their own users are essentially being herded into Apple's iOS corral, without Apple needing to even do much work on its end. Once that gravy train slows down, then we can talk about the decisions Apple will be forced to make to maintain growth, such as the price slashing and billion dollar ad campaigns that Samsung and Microsoft have infamously tried, without much success. But right now, can we stop the handwringing faux-pity over Apple's dire problems of making too much money while selling too many phones with the dire result of being challenged to improve upon that performance? Because that's not a problem, it's every CEO's fantasy. Following upon this first segment, a second looks specifically at Apple's business outside of iPhones.